The First Annual Milwaukee Firkin Craft Beer Festival will be held at Cathedral Square Park on June 12th. Beers from many local brewers will be served and voted upon by the attendees. A firkin, according to Merriam-Webster, is "any of various British units of capacity usually equal to 1/4 barrel". 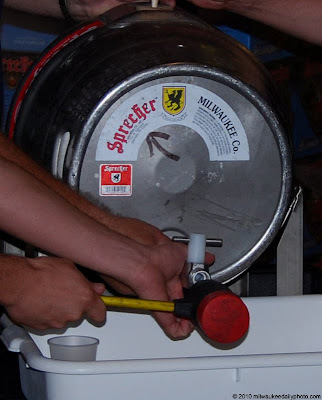 The barrel above is a firkin, tapped at Sprecher last fall as part of their Beer Week festivities.